Google TV launched on two retail product lines: The Logitech Revue and Sony Internet TV. I have both of them and there are definitely some clear distinctions between the two. I’m not sure one is entirely better than another, but it’s strange, although not without precedent, to see Google TV implemented differently. It’s just more fuel for the Android comparison. The Logitech Revue seems a bit more consumer-friendly where the Sony Google TV Blu-ray player has Sony’s distinct industrial feel throughout the hardware and the software. The Logitech option ships with a touchpad-equipped full keyboard where Sony opts for a QWERTY keypad controller slightly smaller than the a PS3 controller. One does the Internet better, while the other plays nicer with more AV hardware. There’s enough difference here to at the very least cause several interested shoppers to pause, stare at the two for a bit and then move on in a daze. I felt almost immediately that the Sony Internet TV Blu-ray Player seemed faster and provided a more smooth interface. Where the Logitech Revue stutters through all the menus and options, the Sony player is quite smooth. It’s most noticeable on the Internet, though. Browsing the Internet on Sony Google TV is rather pleasing in contrast to the Logitech Revue, on which pages take a significant longer time to load. Acid3 still reports a 99/100, but a lot less tests reported slow rendering than Chrome on the Revue, which seems to confirm my findings. Combine the extra speed with a different controller scheme (more on that down farther) and browsing the Internet on your HDTV is almost enjoyable — but still not perfect thanks to the stripped-down Google TV browser. I’m not sure why, but the Logitech Revue plays more online media. 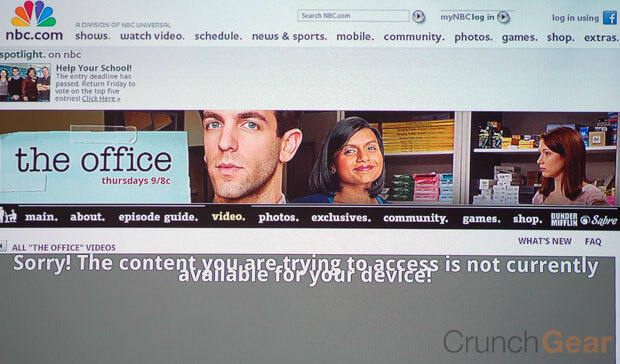 NBC.com for one throws up a warning on the Sony device where most content from that site plays just fine on the Logitech Revue. Neither play ABC, CBS, or Fox content right now, but the Logitech scores extra points just because of NBC.com. Simply put, the Logitech Revue supports nearly every piece of AV equipment ever created where the Sony does not. Logitech worked the Logitech Harmony database into the Revue, which is somewhat of a necessity seeing how Google TV is supposed to act as an intermediary between a set-top box and an HDTV. I had no issues adding my TiVo HD, InFocus projector, and older Onkyo AV receiver to the Revue’s controller list. It was different story when setting up the Sony player. First off, the Sony only has a short list of supported hardware and does not allow users to add to it, which left my InFocus projector off of the list. Not a huge deal, but the Sony remote will not control the power, meaning the other remote still has to be handy. Then, when it came to hooking up the STB, instead of asking for the model number, the Sony asks users to run through a list of remote control codes until one worked. The only thing is, the list didn’t have a TiVo option, so I’m stuck using a code set for a Comcast box that happens to be missing several controls, like the Clear command. It’s probably best to stay away from the Sony if you have a random assortment of AV equipment. Surprise, surprise, Google TV does not have a persistent skin. The Sony’s menu system is noticeably darker [above] than the Logitech Revue’s and some of the shortcuts in the Settings menu are slightly different. 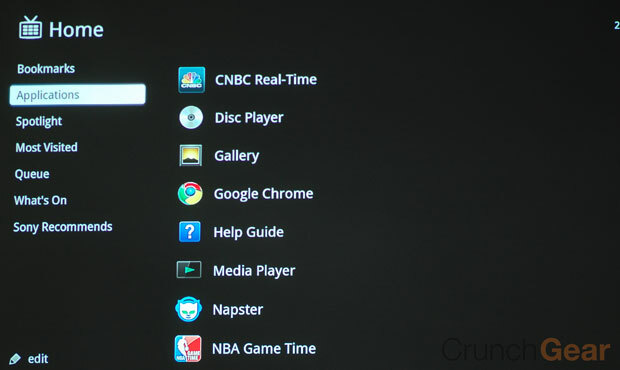 The core system functions, like Google TV Search, still look and work the same, however. Logitech’s proprietary apps make the whole system feel a bit more friendly. Sony’s DLNA client looks straight out of 2006 with just tiled folders, where Logitech’s option is, well, more refined and classy. That’s big as the DLNA server part of Google TV is a big selling point as you’re supposed to be able to easily poll online and networked sources for your content. The average consumer is used to pretty interfaces now and Sony’s look and feel more on the OEM side than Logitech’s. Logitech ships with what is essentially a full size keyboard with a trackpad and directional pad embedded on the right hand side. Sony went with a QWERTY keypad that feels more like a PS3 accessory than anything else. Both work great, just differently. The Sony remote feels like the next-generation of TV remotes. It’s solid, compact and functional — it’s a Sony product in other words. This is the better option for Internet browsing thanks in part to its shoulder-mounted scroll button. Hold this down and then swipe your thumb over the optical mouse nub to scroll any which way. Clever. The Logitech keyboard-turned-remote is a bit unwieldy but certainly functional. It’s a keyboard, so typing on it is a non-issue. 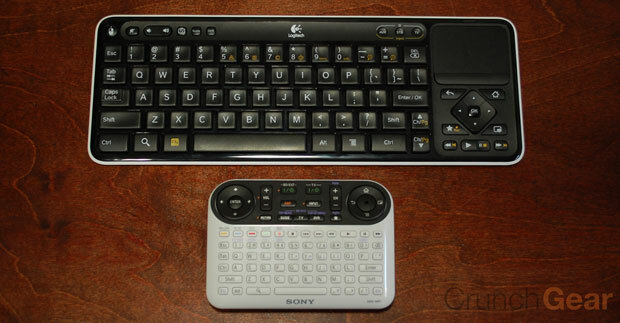 I typed 90% of my Google TV review on the Revue with this keyboard. Then again, not many people will probably do that. 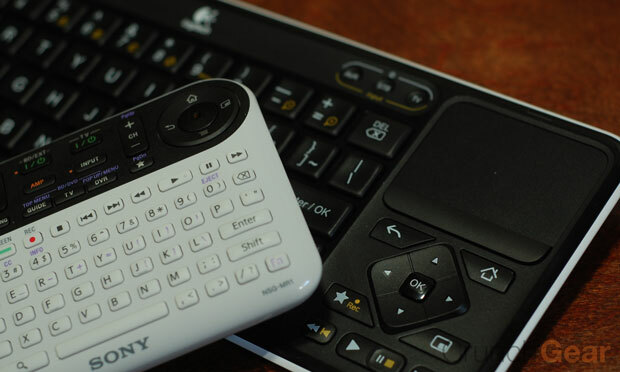 But still, it doesn’t limit Google TV’s use in anyway where typing even an email on the Sony remote is painful. I would say that the Logitech keyboard might be the option with the easiest learning curve. The Sony remote is a mash-up of buttons and pads, with many buttons serving alternative commands along with a Fn button. Which one should you buy? Well, I’m not sure you should buy either, but I would probably go with the Logitech player. I like the full keyboard, it works with a nice webcam and at $300, it’s $100 less expensive than the Blu-ray-equipped Sony option. The performance advantage of the Sony isn’t all that significant at this time and the Logitech works with more AV equipment. But that’s just me.